BMW fans are in for quite a treat as the next generation BMW 7-Series (G11) has been partially unveiled ahead of the official premiere scheduled for September at the Frankfurt Motor Show. Recently a superb image of the side profile of the car has appeared on the internet. 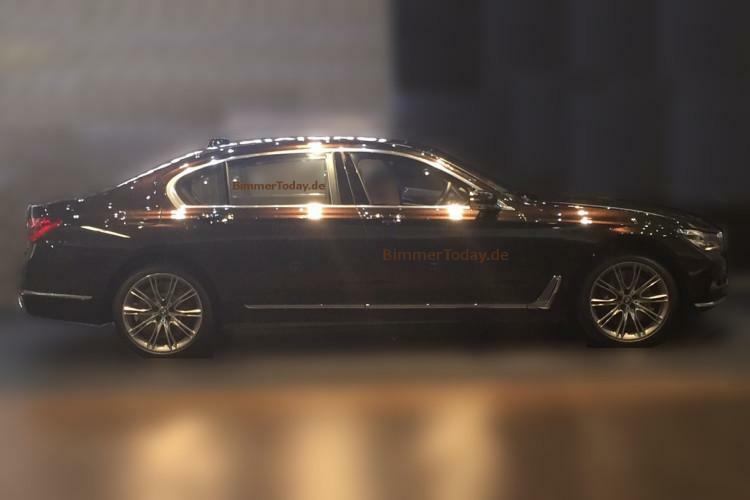 And teasing actions have not debutet now as on New Year’s Eve several images showing the next generation BMW 7-Series (G11) have appeared on the internet causing quite a stir. As far as the current extrior aspect of the car goes the new images show BMW benefits from a significant amount of chrome trim, however no conclusions are to be drawn as the image might show the Luxury Line version. Changes will come in the weight department too as the next generation BMW 7-Series (G11) is expected to be 130 kg lighter. Motivation won’t be a problem as the next generation BMW 7-Series (G11) will come with the latest-gen six-cylinder engines and a revised eight-speed Steptronic transmission. Things will look good on the interior too as the new star from BMW will have touchscreen iDrive system, a remote parking system and a two-axle air suspension equipped with automatic self-leveling. This entry was posted in BMW and tagged 7-Series, BMW, Partially, Revealed, The next generation, The next generation BMW 7-Series. Bookmark the permalink.